When I saw these TV show inspired tees I instantly fell in love with them! These tees are only $13.99 each and come in all of the colors and designs shown here. If you’re a fan of The Office or Stranger Things, these tees are a must-have! If there’s one thing I can’t resist it’s the stripes/floral combo. I absolutely ADORE this top and it’s only $9.99! It comes in one other color. 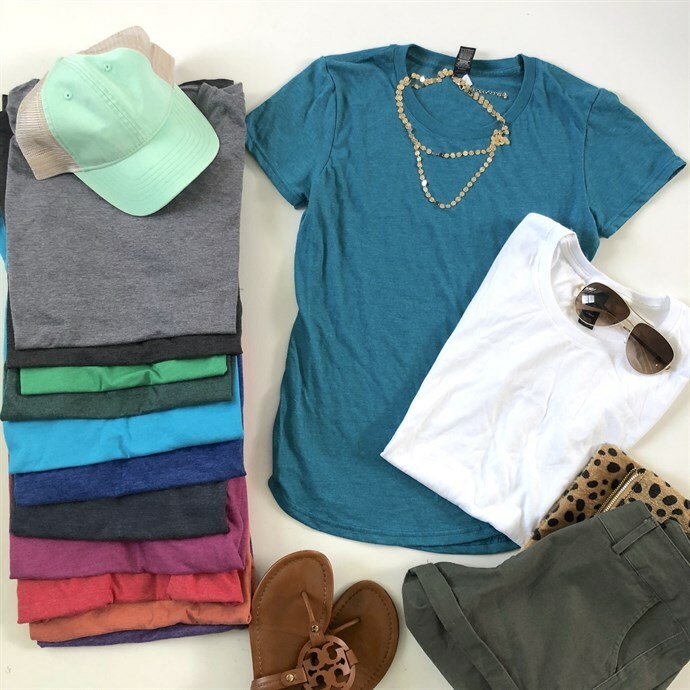 I love basics and I love all the colors that are available in these tri-blend tees. At only $7.99 a pop you can afford to stock up! Grab a ‘go to’ racerback tank top for summer! This tank top is sure to be one of your favorites! Soft and light it will make the perfect Summer addition to your wardrobe. I love the longer length of these! Say yes to these cute summer shoes! Perfect for anything from a skirt to a pair of pants! Available in three neutral colors for all your wardrobe needs! These are just a few of my favorite things available on Jane.com right now. Pop over and browse the site for more affordable fashion!